A while back I discovered that they’re selling photographic film again, so I bought a package of three rolls of 35mm Kodak color film. 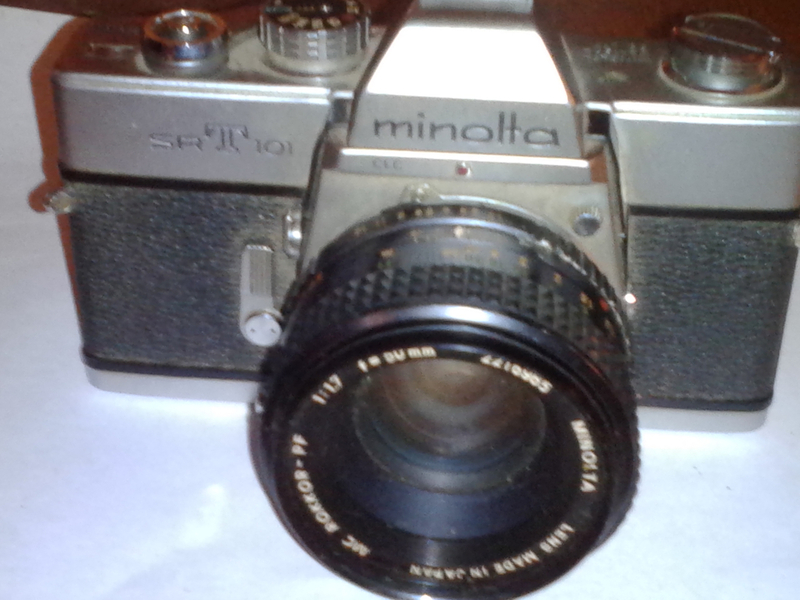 Not sure what I’ll photograph, but the Minolta 35 mm SLR takes a hell of a lot better pictures than my phone. Actually, than any phone—and any digital camera. I got home, set the film aside (it’s a lot more expensive than the last time I used film) and looked for my camera, which hadn’t been used for a couple of decades. I couldn’t find it. I was sure I’d put it in the middle drawer of my dresser, but no matter how much I rummaged I couldn’t find it. And damn it, I’d paid eighteen dollars for the film and didn’t keep the receipt. That was a few days ago. So yesterday I decided to look again, maybe it was in a different drawer? I looked through all of them, and finally rummaged through the one I’d looked in earlier. And I found a small case with a zipper, and there was a camera inside. An old sixteen millimeter, the kind you used flash cubes with. Looking more, I found another camera. It was a cheapo as well. And then at the back of the bottom of the drawer, there it was. My old camera, the SLR (I have another 35mm but it’s not nearly as good). Checking it out I wondered if I could remember how to use it. On the bottom was a screwed in battery cover. I opened it and stuck the battery in my pocket, since after half a century that battery’s certainly more than dead. So I want back to Walgreen’s for a new battery. Two days later as I was eating my burrito I remembered that film changed sometime in the 1980s, with the film speeds changing from ASA to ISO, so I put off opening the battery until I could do a little research. I found that the camera’s built-in light meter wouldn’t work; conversion was more complex than converting Fahrenheit to Celcius. So now I’m going to have to schlep all the way over to the west side of town, or all the way up to the north side. And then I thought of the other camera—the one we call a “phone”. It could probably be used as a light meter, so it looks like I have a little more research. So I downloaded two or three photographic light meters, all of which were completely incomprehensible and none of which came with instructions. So it looks like my only recourse is to go to the camera store and buy a light meter. I googled, and everything was either on the far north side of town or the far west side. One listed was Best Buy, and since I’d decided to hook my TV to the network I needed a cable and went there. They had the short cable I needed, and lots of camera supplies, but no light meters. It’s probably because cameras had built-in light meters for the last half century, but film changed from ASA to ISO three decades ago or so, so it would no longer work even if they still made batteries for it. So I asked the guy for directions to the camera shop, got in the car and looked at Google Maps, and couldn’t find the damned place! When I got home I looked it up again, have a better idea of where it is, and will have to go back out there, but I’m calling first. I should have called. I found it on the map, drove out there, and found the hard to find camera store. Their cheapest light meter was over $250! That’s way, way too much. The store guy explained that it was because so few people are shooting film now, and new cameras have built-in light meters so they only made really fancy ones. It made sense, but of course I was disappointed. Not sure what to do now, I’m not paying that much for a light meter! I only paid fifteen bucks for one when I was a teenager. Then, on my way out, I saw something that cheered me greatly—a small blackboard with a notice that they could digitize VCR tape! It’s worth twenty five bucks to me to get that tape of my kids when they were kids digitized. Any ideas? Know of a decent light meter Android app?